With loose center caps and special puzzle lubricant. 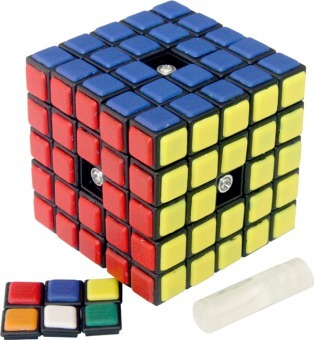 The DIY tiled original Prof. cube (with solid pieces) has loose caps for easy access to the screw heads and includes, 1 bottle of special puzzle lubricant and 1 tube of Instant glue gel. Please use this very sparingly when gluing the center caps.